They furnish me with happy feelings of an intensity such as I cannot derive from other realms." You are allowed to download everything for your own use only. 57 Netsuke, 62 Inro and lacquer works of art plus 3 Ivory carvings. 82 Snuff bottles, 74 Pendants, 25 Jade and hard stone carvings. by the world's leading experts. Netsuke, inro, ojime, lacquer works of art, snuff bottles, pendants, jade and ivory carvings. Read the "Quotes" by Neil K. Davey, Robert Hall, Richard Marchant, Clare Chu (Clare Lawrence) and Michael Dean. First published as an interactive, reference catalogue, of an exceptionally fine collection on a CD-Rom. But as the CD-Rom will no longer work with the latest Windows - This reference work is now available here. 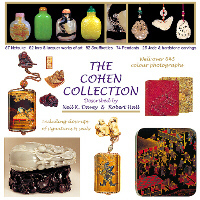 In addition to 'The Cohen Collection' the out of print book below is included too! An important private collection consisting of 280 selected netsuke in ivory and wood together with 76 choice inro all complete with ojime and netsuke - as well as several fine lacquer boxes, are all individually described. The connoisseur will appreciate the excellent work of several 18th century master carvers as well as that of more recent artists. This book differs from most other studies, as it is not purely technical, although it contains useful and practical information. In the hope of attracting new enthusiasts the author has written an entertaining account of his personal experiences in forming this collection, relating many amusing incidents as well as describing the pleasure and satisfaction to be enjoyed by those who collect these elusive miniatures of Japanese art. This complete reference work is now available here. without permission in writing from John Neville Cohen. Both of these publications are valuable and beautiful reference works for the serious antique collector and for a small fee of just 25 Euros you can have unlimited access to them both. Unlimited use, but I am not responsible for Internet, or computer problems that are beyond my control. The not so distant famous relatives of the Bind side of our family.